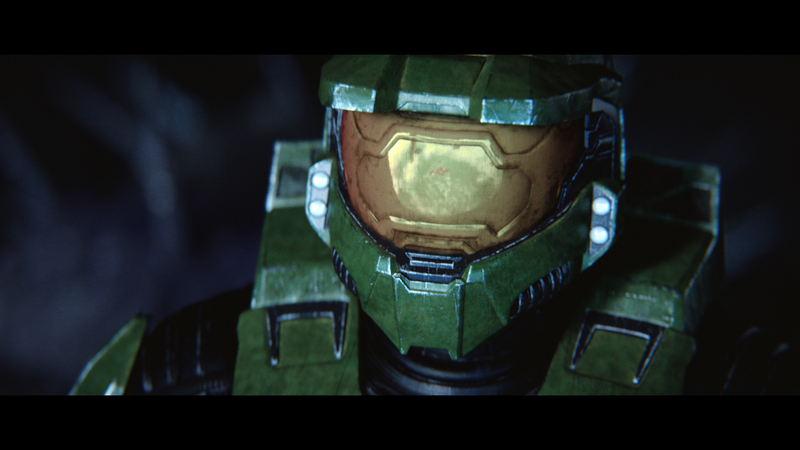 Complete the Master Chief Saga playlist. Kill 100 enemies or players. Kill 20,000 enemies or players. Collect 10,000 campaign or playlist medals. Get killed by the Guardians. Kill a 343 developer in matchmaking or someone who has this achievement. Complete 10 missions or multiplayer games. Complete 100 missions or multiplayer games. Play a multiplayer or co-op game at least 3 months after your first game. Complete all campaigns on Normal difficulty. Complete all campaigns on Heroic difficulty. Complete all campaigns on Legendary difficulty. Complete a campaign mission or a match of multiplayer. Complete each individual game specific LASO playlist for every Halo game. Halo CE: Complete The Silent Cartographer. Halo CE: Complete Assault on the Control Room. Halo CE: Complete The Pillar of Autumn. Halo CE: Complete The Truth and Reconciliation. Halo CE: Beat the par time on The Silent Cartographer. Halo CE: Beat the par time on Assault on the Control Room. Halo CE: Beat the par time on The Pillar of Autumn. Halo CE: Beat the par time on Halo. Halo CE: Beat the par time on The Truth and Reconciliation. Halo CE: Beat the par time on 343 Guilty Spark. Halo CE: Beat the par time on The Library. Halo CE: Beat the par time on Two Betrayals. Halo CE: Beat the par time on Keyes. Halo CE: Beat the par time on The Maw. Halo CE: Beat par time on all Halo: CE levels. Halo CE: Beat the par score on The Silent Cartographer. Halo CE: Beat the par score on Assault on the Control Room. Halo CE: Beat the par score on The Pillar of Autumn. Halo CE: Beat the par score on Halo. Halo CE: Beat the par score on The Truth and Reconciliation. Halo CE: Beat the par score on 343 Guilty Spark. Halo CE: Beat the par score on The Library. Halo CE: Beat the par score on Two Betrayals. Halo CE: Beat the par score on Keyes. Halo CE: Beat the par score on The Maw. Halo CE: Beat the par score on all Halo: CE levels. Halo CE: Activate Terminal 1 on The Pillar of Autumn. Halo CE: Activate Terminal 2 on Halo. Halo CE: Activate Terminal 3 on The Truth and Reconciliation. Halo CE: Activate Terminal 4 on The Silent Cartographer. Halo CE: Activate Terminal 5 on Assault on the Control Room. Halo CE: Activate Terminal 6 on 343 Guilty Spark. Halo CE: Activate Terminal 7 on The Library. Halo CE: Activate Terminal 8 on Two Betrayals. Halo CE: Activate Terminal 9 on Keyes. Halo CE: Activate Terminal 10 on The Maw. Halo CE: Activate all Halo: CE Terminals. Halo CE: Find and claim the Iron skull in remastered mode. Halo CE: Find and claim the Mythic skull in remastered mode. Halo CE: Find and claim the Boom skull in remastered mode. Halo CE: Find and claim the Foreign skull in remastered mode. Halo CE: Find and claim the Famine skull in remastered mode. Halo CE: Find and claim the Bandanna skull in remastered mode. Halo CE: Find and claim the Fog skull in remastered mode. Halo CE: Find and claim the Malfunction skull in remastered mode. Halo CE: Find and claim the Recession skull in remastered mode. Halo CE: Find and claim the Black Eye skull in remastered mode. Halo CE: Find and claim the Eye Patch skull in remastered mode. Halo CE: Find and claim the Pinata skull in remastered mode. Halo CE: Find and claim the Grunt Birthday Party skull in remastered mode. Halo CE: Find and claim all Skulls in Halo: CE. Halo CE: Complete every level of the game on Heroic difficulty. Halo CE: Complete every level of the game on Legendary difficulty. Halo CE: Complete the level The Pillar of Autumn on Legendary without picking up an overshield. Halo CE: Complete The Pillar of Autumn on Legendary without picking up a health kit. Halo CE: Complete Halo without entering a vehicle. Halo CE: Complete The Library on Heroic or Legendary difficulty without dying. Halo CE: Complete Two Betrayals on Legendary difficulty without killing any Grunts. Halo CE: Complete Two Betrayals on Legendary difficulty without picking up a new weapon. Halo CE: Kill every Elite on the level Keyes on Heroic or Legendary difficulty. Halo CE: Complete a Halo: CE playlist. Halo CE: Complete three Halo: CE playlists. Halo CE: Complete the Halo: CE LASO Campaign playlist. Halo CE: Kill a Hunter with one pistol round. Halo CE: Trigger a hidden music cue in Halo: CE. Halo CE: Fight alongside Chips Dubbo and listen to his words of wisdom. Halo CE: Disapprovingly look at Captain Keyes' abandoned pipe. Halo CE: Find the hidden Rex sign on The Maw. Halo CE: Listen to the Thirsty Grunt talk about his eating habits. Halo CE: It's a sign. Halo CE: Ride in a Pelican for several seconds on the level 343 Guilty Spark. Halo CE: Complete a level without jumping. Halo CE: Complete every level of the game having seen it in both classic and remastered mode. Complete any co-op level on Normal difficulty. Complete any co-op level on Heroic difficulty. Halo CE: Complete any level on Heroic difficulty or higher without taking health damage. Collect 9,000 campaign or playlist medals. Halo CE: Play Halo: CE on the 15th of any month. Halo CE: Halo CE: Complete all Halo: CE Legendary campaign missions in under 3 hours. Halo 2: Complete Cairo Station. Halo 2: Complete The Arbiter. Halo 2: Complete The Oracle. Halo 2: Complete Delta Halo. Halo 2: Complete Sacred Icon. Halo 2: Complete Quarantine Zone. Halo 2: Complete High Charity. Halo 2: Complete The Great Journey. Halo 2: Beat the par time on Cairo Station. Halo 2: Beat the par time on Outskirts. Halo 2: Beat the par time on Metropolis. Halo 2: Beat the par time on The Arbiter. Halo 2: Beat the par time on The Oracle. So You Don't Want the Tank? Halo 2: Beat the par time on Delta Halo. Halo 2: Beat the par time on Regret. Halo 2: Beat the par time on Sacred Icon. Halo 2: Beat the par time on Quarantine Zone. Halo 2: Beat the par time on Gravemind. Halo 2: Beat the par time on Uprising. Halo 2: Beat the par time on High Charity. Halo 2: Beat the par time on The Great Journey. Halo 2: Beat par time on all Halo 2 levels. Halo 2: Beat the par score on Cairo Station. Halo 2: Beat the par score on Outskirts. Halo 2: Beat the par score on Metropolis. Halo 2: Beat the par score on The Arbiter. Halo 2: Beat the par score on The Oracle. Halo 2: Beat the par score on Delta Halo. Halo 2: Beat the par score on Regret. Halo 2: Beat the par score on Sacred Icon. Halo 2: Beat the par score on Quarantine Zone. Halo 2: Beat the par score on Gravemind. Halo 2: Beat the par score on Uprising. Halo 2: Beat the par score on High Charity. Halo 2: Beat the par score on The Great Journey. Halo 2: Beat the par score on every Halo 2 level. Halo 2: Activate Terminal 1 on Cairo Station. Halo 2: Activate Terminal 2 on Outskirts. Halo 2: Activate Terminal 3 on Metropolis. Halo 2: Activate Terminal 4 on The Arbiter. Halo 2: Activate Terminal 5 on The Oracle. Halo 2: Activate Terminal 6 on Delta Halo. Halo 2: Activate Terminal 7 on Regret. Halo 2: Activate Terminal 8 on Sacred Icon. Halo 2: Activate Terminal 9 on Quarantine Zone. Halo 2: Activate Terminal 10 on Gravemind. Halo 2: Activate Terminal 11 on Uprising. Halo 2: Activate Terminal 12 on High Charity. Halo 2: Activate Terminal 13 on The Great Journey. Halo 2: Activate all Halo 2 Terminals. Halo 2: Find and claim the Thunderstorm Skull on Legendary. Halo 2: Find and claim the Blind Skull. Halo 2: Find and claim the IWHBYD Skull on Legendary. Halo 2: Find and claim the Catch Skull on Legendary. Halo 2: Find and claim the Grunt Birthday Party Skull on Legendary. Halo 2: Find and claim the Famine Skull on Legendary. Halo 2: Find and claim the Envy Skull on Legendary. Halo 2: Find and claim the Assassins Skull on Legendary. Halo 2: Find and claim the Mythic Skull on Legendary. Halo 2: Find and claim the Sputnik Skull on Legendary. Halo 2: Find and claim the Anger Skull on Legendary. Halo 2: Find and claim the Ghost Skull on Legendary. Halo 2: Find and claim the Iron Skull on Legendary. Halo 2: Find and claim the Black Eye Skull on Legendary. Halo 2: Find and claim all Skulls in Halo 2. Halo 2: Collect the Master Chief toy in Delta Halo. Halo 2: Collect the Prophet of Regret toy in Regret. Halo 2: Collect the Arbiter toy in Sacred Icon. Halo 2: Collect the Tartarus toy in Quarantine Zone. Halo 2: Collect the Cortana toy in Gravemind. Halo 2: Collect the Librarian toy in Uprising. Halo 2: Collect the Rampant Cortana toy in High Charity. Halo 2: Collect the Didact toy in The Great Journey. Halo 2: Collect all eight Halo toys. Halo 2: Complete every level of the game on Normal difficulty. Halo 2: Complete every level of the game on Heroic difficulty. Halo 2: Complete every level of the game on Legendary difficulty. Halo 2: Complete a Halo 2 playlist. Halo 2: Complete three Halo 2 playlists. Halo 2: Drive a Scorpion while playing as the Arbiter. Halo 2: Stick a Plasma Grenade to a Stealth Elite on Outskirts. Halo 2: Listen to the Cowardly Grunt's woes. Halo 2: Listen to a hidden music cue in Halo 2. Halo 2: Fight alongside the legendary Chips Dubbo and listen to his words. Halo 2: Grab the energy sword on the level Outskirts. Halo 2: In The Oracle, find the holo-drone before the Heretic Leader activates it. Halo 2: Spot the hippo on the walls of Headlong in classic multiplayer. Halo 2: Spot the Sid graffiti on the walls of Coagulation in classic multiplayer. Halo 2: View both signs in the level Metropolis. Halo 2: View the smiling face in the classic multiplayer map Coagulation. Halo 2: View this hidden message on the classic Beaver Creek map. Halo 2: Shoot the soccer ball in the level Metropolis. Halo 2: Complete the level Regret with the Prophet Birthday Skull activated. 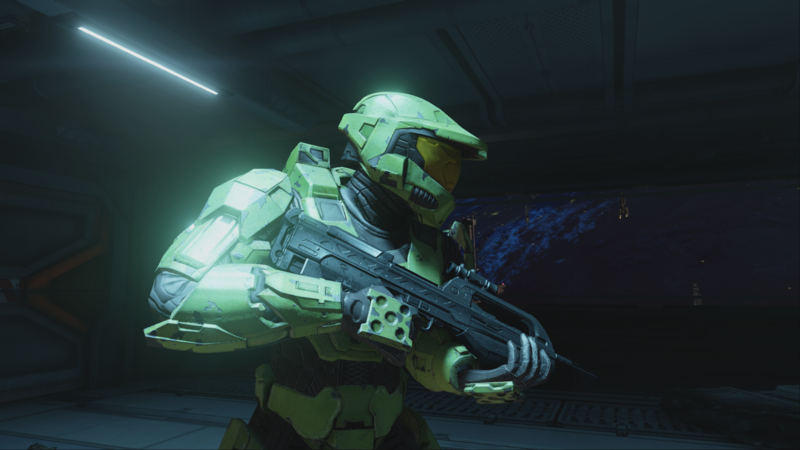 Halo 2: Complete a level in co-op on Heroic or Legendary with the Masterblaster Skull active. Halo 2: Complete a level with only the Streaking Skull active on Heroic or Legendary. Halo 2: Complete Metropolis without entering a vehicle on Heroic or Legendary. Halo 2: Complete Delta Halo without entering a vehicle on Heroic or Legendary. Halo 2: Acquire the Scarab Gun. Halo 2: Kill 7 opponents from behind in a row without being spotted. Halo 2: Complete any campaign level without dying on Normal or harder. Halo 2: Kill an enraged, berserk Brute using melee. Halo 2A MP: In one match, steal a total of 5 occupied vehicles from opponents. Halo 2A MP: Complete a game in every one of the 6 updated Anniversary MP maps. Halo 2A MP: In Anniversary multiplayer, receive 2 or more Double Kill medals. Halo 2 MP: In Classic or Anniversary matchmaking, stop the killing spree of another player. Halo 2A MP: Blow up the Banshee or Hornet in flight while piloted, with the Rocket Launcher. Halo 2A MP: Get awarded at least 10 different medals in one multiplayer game. Halo 2A MP: Kill 5 people with melee from behind in Anniversary matchmaking. Halo 2A MP: Kill an opponent that has the Ninja Redux achievement in Anniversary matchmaking. Halo 2A MP: Kill an opponent that has the Legendary Anniversary achievement. Halo 2: Play a game of Halo 2 Anniversary on the 9th of any month. Halo 2: Complete the LASO campaign playlist. Halo 2: Complete all Halo 2 Legendary campaign missions in under 3 hours. Halo 3: Complete The Ark. Halo 3: Complete The Covenant. Halo 3: Beat the par time on Sierra 117. Halo 3: Beat the par time on Crow's Nest. Halo 3: Beat the par time on Tsavo Highway. Halo 3: Beat the par time on The Storm. Halo 3: Beat the par time on Floodgate. Halo 3: Beat the par time on The Ark. Halo 3: Beat the par time on The Covenant. Halo 3: Beat the par time on Cortana. Halo 3: Beat the par time on Halo. Halo 3: Beat the par time on all Halo 3 levels. Halo 3: Beat the par score on Sierra 117. Halo 3: Beat the par score on Tsavo Highway. Halo 3: Beat the par score on The Storm. Halo 3: Beat the par score on Floodgate. Halo 3: Beat the par score on The Ark. Halo 3: Beat the par score on The Covenant. Halo 3: Beat the par score on Cortana. Halo 3: Beat the par score on Halo. Halo 3: Beat the par score on every Halo 3 level. Halo 3: Activate Terminal 1 on The Ark. Halo 3: Activate Terminal 2 on The Ark. Halo 3: Activate Terminal 3 on The Ark. Halo 3: Activate Terminal 4 on The Covenant. Halo 3: Activate Terminal 5 on The Covenant. Halo 3: Activate Terminal 6 on The Covenant. Halo 3: Activate Terminal 7 on Halo. Halo 3: Activate Cortana's Terminal on Cortana. Halo 3: View the communique from Mendicant Bias. Halo 3: Find and claim the Iron Skull on Normal or harder. Halo 3: Find and claim the Black Eye Skull on Normal or harder. Halo 3: Find and claim the Tough Luck Skull on Normal or harder. Halo 3: Find and claim the Catch Skull on Normal or harder. Halo 3: Find and claim the Fog Skull on Normal or harder. Halo 3: Find and claim the Famine Skull on Normal or harder. Halo 3: Find and claim the Thunderstorm Skull on Normal or harder. Halo 3: Find and claim the Tilt Skull on Normal or harder. Halo 3: Find and claim the Mythic Skull on Normal or harder. Halo 3: Complete every level of the game on Normal difficulty. Halo 3: Complete every level of the game on Heroic difficulty. Halo 3: Complete every level of the game on Legendary difficulty. Halo 3: On Tsavo Highway, complete the level without entering a vehicle. Halo 3: On The Ark, complete the level without entering a vehicle on Legendary. Halo 3: Destroy 3 total Phantoms on The Covenant. Halo 3: Trigger the hidden music cue in Halo 3. Halo 3: Find your first missing links. Halo 3: Find a lonely missing link. Halo 3: Fight alongside and listen to The Man. The Legend. Chips Dubbo. Halo 3: Listen to the tale of a young Grunt named Flipyap. Halo 3: Destined for greatness. Halo 3: This stuff is your history! Halo 3: Who DARED to discard this brave animal? Halo 3: Find the poster of the missing man. Halo 3: Listen to the story of the Final Grunt. Halo 3: He's watching you. Halo 3: View 2 different sigils on Valhalla. Halo 3: Play a game of Halo 3 on the 25th of any month. Halo 3: Complete all Halo 3 Legendary campaign missions in under 3 hours. Halo 4: Beat the par time on Dawn. Halo 4: Beat the par time on Requiem. Halo 4: Beat the par time on Forerunner. Halo 4: Beat the par time on Infinity. Halo 4: Beat the par time on Reclaimer. Halo 4: Beat the par time on Shutdown. Halo 4: Beat the par time on Composer. Halo 4: Beat the par time on Midnight. Halo 4: Beat the par time on all Halo 4 levels. Halo 4: Beat the par score on Dawn. Halo 4: Beat the par score on Requiem. Halo 4: Beat the par score on Forerunner. Halo 4: Beat the par score on Infinity. Halo 4: Beat the par score on Reclaimer. Halo 4: Beat the par score on Shutdown. Halo 4: Beat the par score on Composer. Halo 4: Beat the par score on Midnight. Halo 4: Beat the par score on every Halo 4 level. Halo 4: Activate Terminal 1 on Requiem. Halo 4: Activate Terminal 2 on Forerunner. Halo 4: Activate Terminal 3 on Infinity. Halo 4: Activate Terminal 4 on Reclaimer. Halo 4: Activate Terminal 5 on Shutdown. Halo 4: Activate Terminal 6 on Composer. Halo 4: Activate Terminal 7 on Midnight. Halo 4: Activate all Halo 4 Terminals. Halo 4: Complete every level of the game on Normal difficulty. Halo 4: Complete every level of the game on Heroic difficulty. Halo 4: Complete every level of the game on Legendary difficulty. Halo 4: Complete every level of the game on Legendary difficulty, by yourself. Halo 4: Carry a UNSC weapon all the way through Forerunner on Heroic or Legendary. Halo 4: Complete Infinity without one preventable Marine death on Heroic or Legendary. Halo 4: Trick or force a Hunter to fall to its demise on Shutdown on Heroic or Legendary. Halo 4: Take out both Hunters using only the Sticky Detonator on Composer. 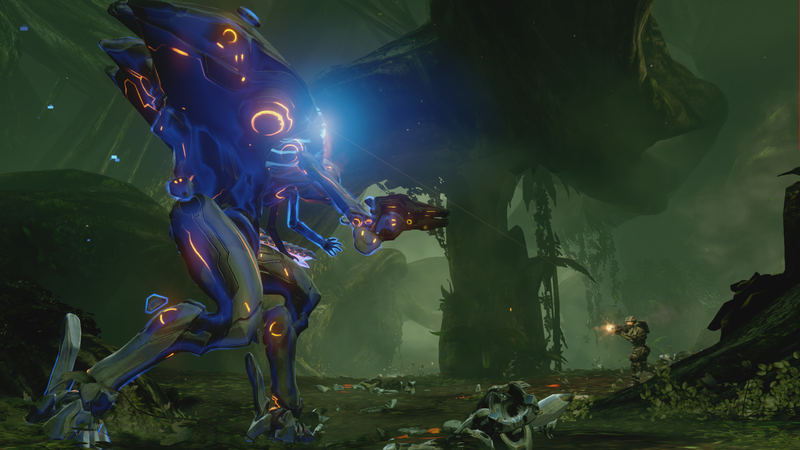 Halo 4: Kill 3 Crawlers in one hit with the Gravity Hammer on Midnight. Halo 4: What do Marines know about sticks? Halo 4: Play a game of Halo 4 on the 6th of any month. Halo 4: Complete all Halo 4 Legendary campaign missions in under 3 hours. Halo 2: Spot the developer in the opening cutscene of Gravemind on Legendary in Classic Mode. Halo 2: View one of the seasonal signs on Zanzibar in classic multiplayer. Halo 2: Complete every level of Halo 2 having seen it in both classic and remastered mode. Halo 3: 4 vehicles, 1 gap on Legendary using Cowbell, Catch, Thunderstorm, Mythic, and Tough Luck. Halo CE: Play a CTF custom game on Blood Gulch with 4 players on the same console. Tri-tip optional. Halo CE: Finish The Silent Cartographer without shooting, grenades, melee, dying or restarting. Halo CE: Destroy four Wraith tanks in Assault on the Control Room with the Scorpion tank. Halo CE: Complete The Truth and Reconciliation with at least four rounds left in your Sniper Rifle. Halo CE: Complete the Warthog ride of The Maw without being forcibly ejected from your vehicle. Halo 4: On Reclaimer, use a Wraith to kill at least four enemy Wraiths on Heroic or Legendary. Halo CE: Kill the first group of enemies on The Truth and Reconciliation without being detected. Halo CE: Storm The Silent Cartographer beach with no Marine casualties on Heroic or Legendary. Halo 2: She's not picking up. Halo CE: Destroy three of the four Banshees on Halo during a single play-through. Complete any co-op level on Legendary difficulty. Halo 4: Access the Master Chief's records on Dawn. Halo 3: Watching. Waiting. Plotting. Halo 2A MP: In Territories, control any 3 Territories simultaneously for 30 seconds. Created and saved 5 Custom Game types. Halo 2A MP: Found and destroyed the BLAST soda can on Stonetown. Halo 2A MP: Found and destroyed the BLAST soda can on Zenith. Halo 2A MP: In King of the Hill, kill 5 opponents within your controlled hill. Created and saved 5 Custom Maps in Forge. Halo 2A MP: On Warlord, get every center powerup that becomes available in a single game. Halo 2A MP: Get 25 melee kills in multiplayer. Halo 2A MP: Win 10 matches on Bloodline in multiplayer. Halo 2A MP: Found and destroyed the BLAST soda can on Warlord. Halo 2A MP: On Zenith, personally activate the center energy shield 3 times in one matchmade game. Halo 2A MP: Get 30 kills with the Hornet in multiplayer. Halo 2A MP: Killed 15 opponents that were airborne from a Man Cannon. Halo 2A MP: In Juggernaut, survive as the Juggernaut for 30 seconds. Halo 2A MP: Get 25 kills with the Gungoose in multiplayer. Halo 2A MP: Found and destroyed the BLAST soda can on Lockdown. Halo 2A MP: Get a kill with the Gungoose while airborne. Halo 2A MP: Destroyed all the Halo 2 Anniversary Multiplayer BLAST soda cans. Halo 2A MP: Found and destroyed the BLAST soda can on Bloodline. Halo 2A MP: In Assault, take, plant, and score from the bomb spawn without dying or dropping it. Halo 2A MP: On Lockdown, kill an opponent with the hanging ice. Halo 2A MP: Kill an opponent by detonating a Fusion Coil. Halo 2A MP: With a Sniper Rifle or Beam Rifle kill an enemy that was zoomed in. Halo 2A MP: In Ricochet, pass once, score once, and kill at least one enemy in the same match. Halo 2A MP: On Shrine in CTF, activate the enemy base waterfall and, before it stops, grab the flag. Halo 2A MP: Found and destroyed the BLAST soda can on Shrine. Halo 2A MP: In Anniversary matchmaking, win 10 games as an Elite. Halo 2: Fly the Heretic Banshee. Halo 3: Complete the Halo 3 LASO Campaign playlist. Halo 3: Complete three Halo 3 playlists. Halo 4: Complete the Halo 4 LASO Campaign playlist. Halo 4: Complete three Halo 4 playlists. Find and claim all the campaign skulls in Halo:CE, Halo 2, and Halo 3. Halo 3: Complete a Halo 3 playlist. Collect 2,000 campaign or playlist medals. Collect 3,000 campaign or playlist medals. Collect 4,000 campaign or playlist medals. Collect 5,000 campaign or playlist medals. Halo 4: Complete a Halo 4 playlist. Collect 6,000 campaign or playlist medals. Collect 7,000 campaign or playlist medals. Collect 8,000 campaign or playlist medals. Complete 50 missions or multiplayer games. Complete 200 missions or multiplayer games. Complete 150 missions or multiplayer games. Complete 250 missions or multiplayer games. Complete 300 missions or multiplayer games. Complete 350 missions or multiplayer games. Complete 400 missions or multiplayer games. Complete 450 missions or multiplayer games. Complete 500 missions or multiplayer games. Collect 500 campaign or playlist medals. Collect 1,000 campaign or playlist medals. Kill 5,000 enemies or players. Halo 2: Complete every level of the game on Easy difficulty. Halo 3: Complete every level of the game on Easy difficulty. Halo 4: Complete every level of the game on Easy difficulty. Complete all campaigns on Easy difficulty. Halo 3: Beat the par score on Crow's Nest. Halo 3: Find and claim all Skulls in Halo 3. Halo 3: Find and claim the Blind Skull on Normal or harder. Halo 3: Find and claim the Grunt Birthday Party Skull on Normal or harder. Halo 3: Find and claim the Cowbell Skull on Normal or harder. Halo 3: Find and claim the IWHBYD Skull on Normal or harder. Halo 3: Activate all Halo 3 Terminals. Halo 2A MP: Finished as the top player on the winning team in a matchmade game. 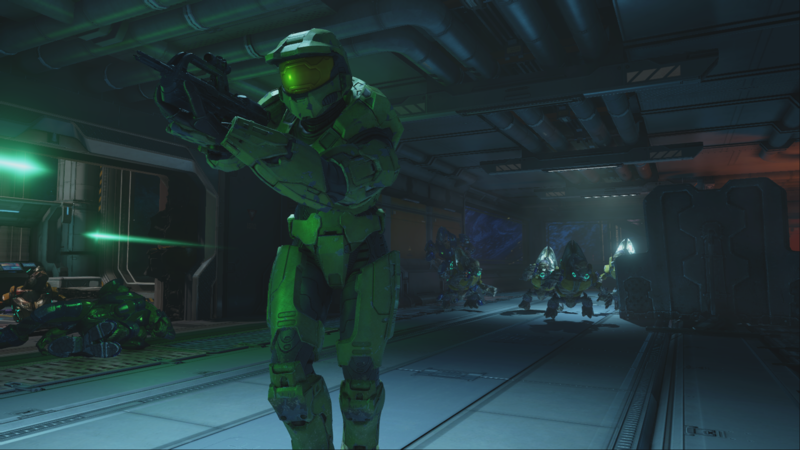 Halo 4: Complete a Spartan Ops mission. Halo 4: Complete all chapters in Spartan Ops Episode 1. Halo 4: Complete all chapters in Spartan Ops Episode 2. Halo 4: Complete all chapters in Spartan Ops Episode 3. Halo 4: Complete all chapters in Spartan Ops Episode 4. Halo 4: Complete all chapters in Spartan Ops Episode 5. Halo 4: Complete all chapters in Spartan Ops Episode 6. Halo 4: Complete all chapters in Spartan Ops Episode 7. Halo 4: Complete all chapters in Spartan Ops Episode 8. Halo 4: Complete all chapters in Spartan Ops Episode 9. Halo 4: Complete all chapters in Spartan Ops Episode 10. Halo 4: Complete all Spartan Ops chapters. Halo 4: Complete all Spartan Ops chapters on Normal difficulty. Halo 4: Complete all Spartan Ops chapters on Heroic difficulty. Halo 4: Complete all Spartan Ops chapters on Legendary difficulty. Halo 4: Complete all Spartan Ops chapters solo on Legendary difficulty. 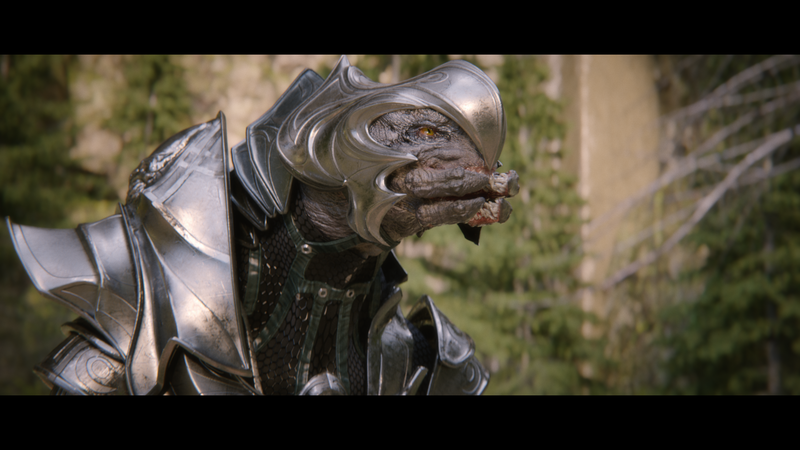 Halo 4: Why are you even here? Halo 4: Save at least one Marine on Hacksaw (Ep.2 Ch.3) of Spartan Ops on Heroic or Legendary. Halo 4: Assassinate a Knight in any Spartan Ops mission. Halo 4: Complete The Cauldron Base of Spartan Ops without losing a generator on Heroic or Legendary. Halo 4: Survive Spartan Miller (Ep.5 Ch.1) of Spartan Ops on Heroic or Legendary. Earn a total of 2,500 Assist medals in multiplayer. Earn a total of 2,500 Headshot medals in multiplayer. Earn a total of 250 Beat Down medals in multiplayer. Earn a total of 100 Legendary medals in matchmade games. Earn a total of 250 Double Kill medals in matchmade games. Earn a total of 100 Killing Spree medals in matchmade games. Earn a total of 500 Grenade Kill or Plasma Kill medals in matchmade games. Earn a total of 250 Killjoy medals in matchmade games. Earn a total of 250 CTF Mode Specific medals in matchmade games. 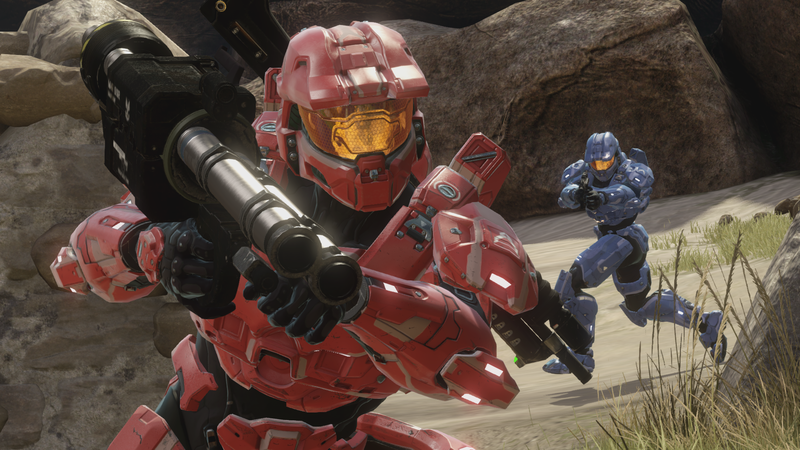 Earn a total of 250 KOTH Mode Specific medals in matchmade games. Halo 2A MP: In Anniversary matchmaking, earn a total of 100 Splatter medals. Halo 2A MP: In Anniversary matchmaking, earn a total of 100 Environmentalist medals. Complete 1 mission with the LASO playlist skulls enabled. Halo CE: Launch a Warthog for at least 5 seconds and have it splatter an enemy. Halo 3: Find the hidden Skull on the Assembly multiplayer map. Halo 3: Find the hidden Skull on the Orbital multiplayer map. Halo 3: Find the hidden Skull on the Sandbox multiplayer map. Halo 3: Find the hidden Skull on the Citadel multiplayer map. 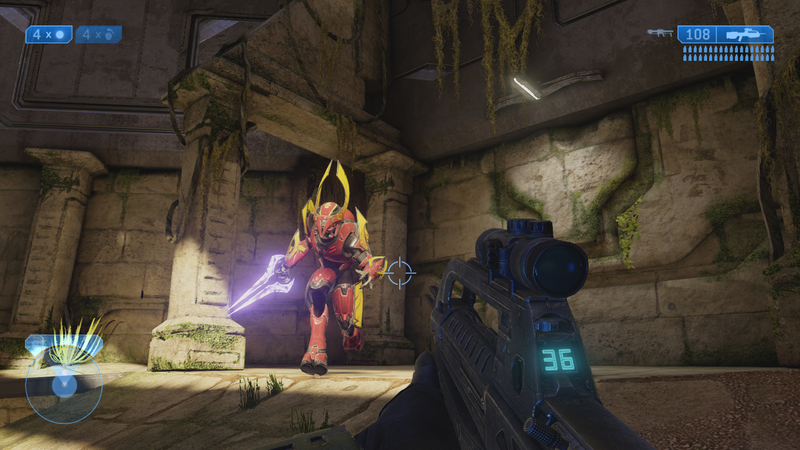 Halo 3: Find the hidden Skull on the Heretic multiplayer map. Halo 3: Find the hidden Skull on the Longshore multilayer map. Halo 3: Find all the hidden multiplayer Skulls. Halo CE: Complete a match on at least 8 different classic multiplayer maps. Halo CE: Complete a match on at least 4 unique game types. Halo 2: Complete a match on at least 8 different classic multiplayer maps. 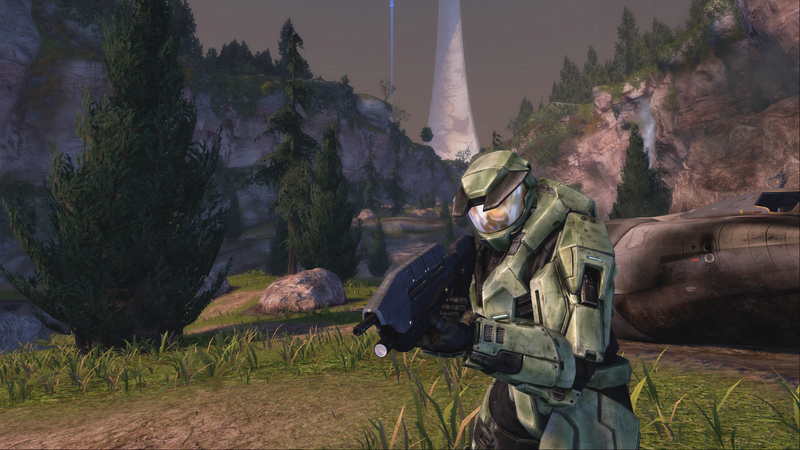 Halo 2: Complete a match on at least 4 different game types in classic multiplayer. Halo 3: Complete a match on at least 8 different multiplayer maps. 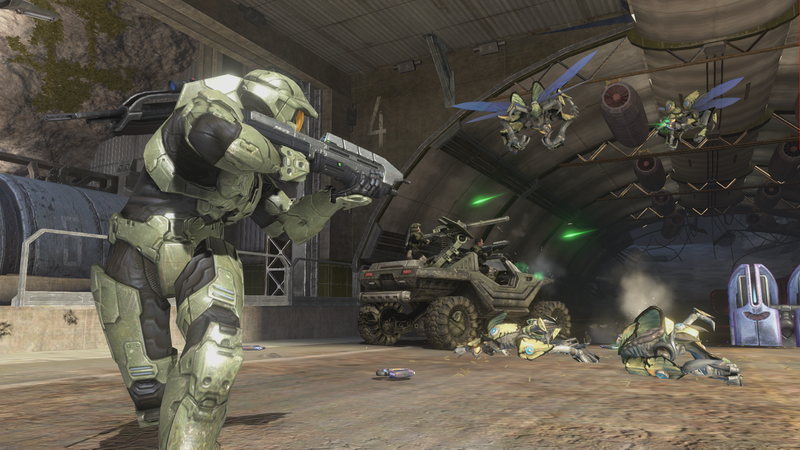 Halo 3: Complete a match on at least 4 different game types in multiplayer. Halo 4: Complete a match on at least 8 different multiplayer maps. Halo 4: Complete a match on at least 4 different game types in multiplayer.